Waxmelters offers a full line of heated hoses for your needs. All our hoses are built of the highest quality smooth Bore Teflon® which is chemical, temperature and shock resistant, while being lightweight, flexible, non-contaminating, non-adhesive and moisture and deterioration resistant. Our hoses can be made without heating or to heat to temperatures from 0°F to 500°F (260°C) at 120, 208, 240, 277, 480VAC. 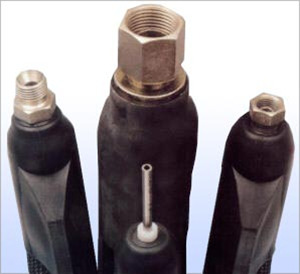 Our hoses can accommodate almost any inner diameter and fittings, including NPT, JIC, and so on. Please contact us for your specific hose request.